The "Figure Eight" is a fun and exciting trick that all trick-performing dogs must know! Whether your dog does freestyle, demonstrations, shows or if you simply want to impress your friends, this is the perfect trick! Learn our 4-step training process that will get your dog to weave in and out of your legs on command. Teaching your dog to weave in and out of your legs. Conditioning your dog to respond to a hand signal. Associating a verbal command to the behavior. Increasing your dog's enthusiasm for a spectacular performance. Thanks Jean for a good trick. I have worked on this before with my dog, but not too successfully. I’m quite small (5 ft) and have a large GSD so getting her to go through my legs fast is quite difficult; I’m not sure whether she doesn’t like the contact as she goes through, but sometimes also if she knocks against me I can get overbalanced. when we’re stationary it’s not too bad, but trying it walking is really difficult unless we’re going very slowly, and it’s much less impressive that way!!! not so cool! Thanks, I really enjoy the Dog Trick Academy stuff! Is the problem that your dog is having trouble walking underneath you because there is not enough room and thus slowing things down, or is it because your dog is so long that you can’t take the next step right away because her rear end is still in front of your other leg? You might want to videotape a few repetitions to see exactly where the problem is. Thanks fir the speedy reply! 🙂 I think it’s a combination of both, but the main problems is her length, and yes her rear end is still there as I go to take my next step. Thanks for that analysis! Hi Maggi, thank you for the videos. 🙂 I can see why you may be having trouble with such a large dog. What if you combined two tricks together? For example, you could get your dog to turn around after going around one leg, which will give you time to move your leg and prepare for the next “through”. I thought you might like to see some videos of Solas and myself doing a bit of work! Hi Maggi. 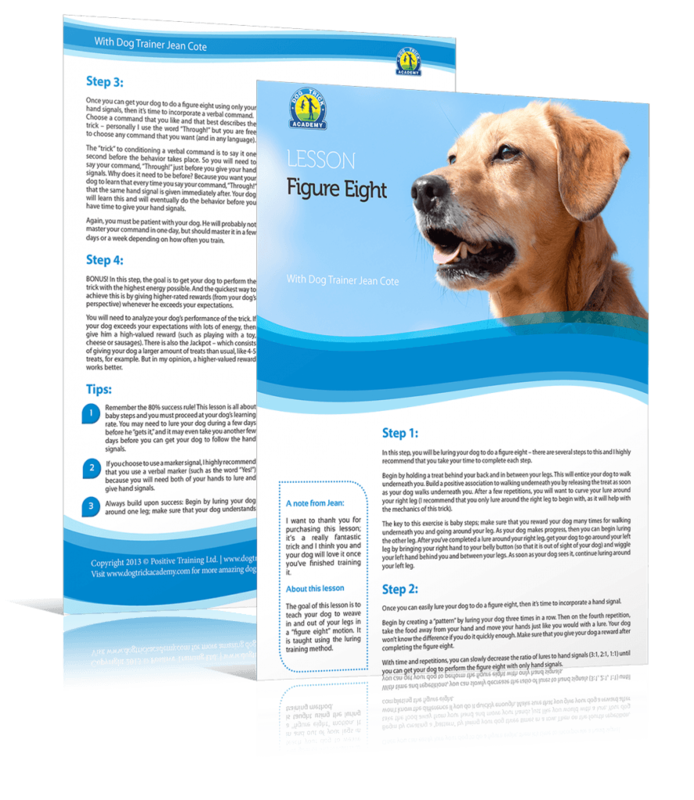 I will do a video for you very shortly… In the meantime, do you think you could provide a video of your dog doing the figure eight? I watched both of the videos you posted, however I did not see the figure eight performed. Maybe I missed it? Hi Maggi, here is the video that I promised you. Jean, Thank you so much for taking the time to make this video! I can’t imagine how you have the time to do this online stuff? I’m going to go away and practice! Solas and I have been doing agility for the past 4 weeks….just starting but here’s a link to how we’ve been doing! Sorry, you’ve probably seen some of them before, but I’m not too computer literate! Hi Maggi, that is awesome that you were able to figure out how to improve the trick. This is one of the reason why I’m such a big proponent of videotaping your training sessions, because when you review them, you always notice little things that you could do better. And you don’t have to review the whole thing, just reviewing 3 minutes of the training will give you a very clear idea of what you can be improving. 🙂 Keep up the excellent work! !